Drops from Ventani the Warder on progression servers before waking up The Sleeper. This still drops off of Ventani the Warder on Al'kabor. Anyone Know what Mob drops it????? Tae Ew shield almost as good if not better and goes for like 5k or less on my server. I would like this as a back item for the stats and sv over my massive underbulk shell but no more warder so no shield, all well. Anyone notice that Gnome and Frogloks aren't included? Sure, most of the other Pally / SK are medium/large, but Dwarves are included. Methinks that Afterlife held the pic for quite a while, then submitted it. Don't think it drops anymore, due to the fact that it drops off Vantani the Warder. Just my 2cp. what idiot pal sk would use a 1h if they could do warders anyways? 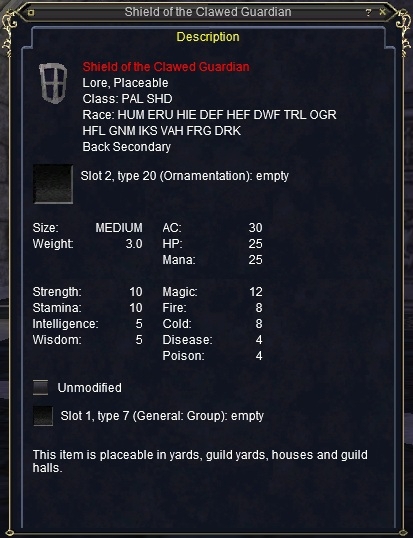 this is a back item, you are a dumbass if you wear it as a shield. Drop in Old Sleeper's Tomb only. If Kerafyrm is awakenen of your server, this shield will no longer drop. It used to drop off Vantani the Warder. If that's true then how did Afterlife get to submit that screen shot? I was under the impression the Sleeper is gone on almost all servers besides FV and PvP and the newer euro servers. The screenshot isn't dated. I wouldn't be surprised if this item was delayed both in submission by AL and in posting by allakhazam, especially if the item was a historical drop and not something currently in any loot tables. In fact, since AL did submit it, i suspect it probably is an older image. I would guess that AL hasn't spent much time in ST since the release of Luclin. Also, based on their web page, they have been in POP almost exclusively since it came out. It is strange to see an item with this many stats on it be non-magical. The only comparable shield I can think of (other than classes-wise) is Lodi and that is magical. For wielding along with a MDS or what have you I'd take Lodi to bash magic mobs despite the inferior stats. That means an appropriately high-level rogue can pickpocket it. This would have to be the best pp loot ever. Who cares if it's magic or not? I wear mine on my back.